A picture is worth a thousand words, but did you know that a video is worth a thousand pictures? Videos are revolutionizing the way teams and organizations communicate with each other and are increasingly being used to facilitate knowledge-sharing and training within organizations. Intranet video portals for the enterprise are gaining popularity because they are effective for sharing information across the entire organization. SharePoint 2013 does a great job supporting video communications-from sharing a video across a team site to building a knowledge management/video portal for the enterprise. 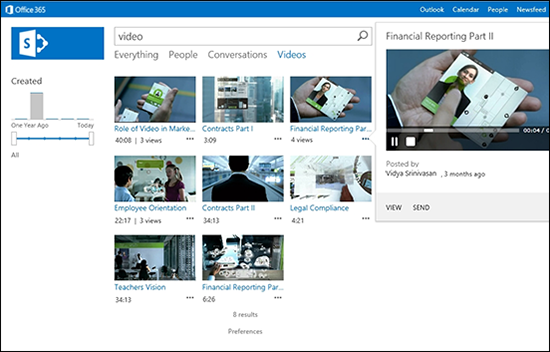 To understand how videos in SharePoint 2013 work, it is important to understand how videos are organized. Videos are organized in a manner similar to document sets, which is a group of related documents that can be created in a single step and managed as one entity. 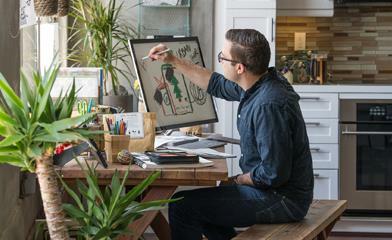 To learn more about document sets, see Introduction to document sets. SharePoint creates a stub (think of it as a folder) to hold a video and all the related contents, such as user-defined properties, thumbnails, video renditions, and other documents related to the video. When you upload a video file, SharePoint automatically creates this stub for that video. You can imagine the video set to be the encapsulation of everything related to that video. In the next few sections, we’ll talk about how videos can be uploaded, watched, and searched in SharePoint 2013. Users can also enable a download link and embed code in the video player page. So, now viewers can download a video from your site, and/or embed this video in a different site. 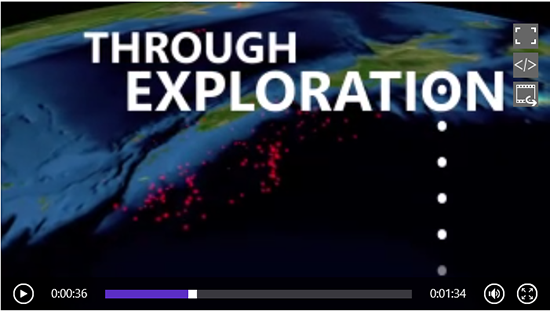 Another cool feature in the video player page is the ability to add related items. Imagine you upload a video of a presentation, but you also want to add the PowerPoint deck used in that presentation for your viewers. In SharePoint 2013, it’s right alongside! Simply drag and drop the relevant files that you feel the viewers of this video should see. Everything is in a single page! Here is a glimpse of the video edit form where users can add relevant metadata. SharePoint 2013 has a built-in HTML5 media player that is used to play all video files that are compatible with the HTML5 <video> implementation for the current browser. This means you can now play videos on mobile devices such as iOS that don’t support Silverlight. If the format is not playable by the HTML5 player, then we use Silverlight. The video is auto-played when the user opens the video player page. The player streams video content using the BLOB cache, progressive streaming, and bit-rate throttling in the same manner as the SharePoint 2010 media player. You can find the list of media formats supported by HTML5 in the Wikipedia article HTML5 video, and the list of media formats supported by Silverlight in the article Supported media formats, protocols, and log fields. Both media players support exposing an embed code and switching renditions on-the-fly. The video renditions feature lets you upload multiple renditions of a video-whether they are different codecs/formats or different bitrates. You can switch seamlessly on-the-fly just by choosing the desired rendition from the media player. By default, the video with the lowest bitrate is chosen, to conserve bandwidth. You can always change the default rendition from the Manage Renditions page. This is a screenshot of the HTML5 player on Internet Explorer 10. You can see the full screen, embed code, and switch renditions icons on the video player. And, Yes! We are touch-friendly. Videos can be uploaded to any library, but you can get the most out of SharePoint if you upload videos to a library that has the video content type enabled. For example, the Asset Library, which is customized for storing digital assets. You can enable the video content type in other libraries by adding video from the existing site content types in the library settings. Uploading a video is as simple as dragging the files into the drop target. We all know the web has evolved tremendously over the years. Many users think of drag and drop when they want to upload a file, and I’m excited that SharePoint fulfils that expectation. Drag and drop really simplifies life when it comes to uploading hundreds of files to a library. Upload video from my computer: Use this option to upload videos from your computer using Windows Explorer. Provide a link to a video: Use this option to provide a link to a video file that resides in another site (such as videos from other SharePoint sites or file shares). It is important to note that your URL should point to a video stream file and not to a video player URL. Provide code to embed a video from the web: Use this option to paste the embed code for your video from anywhere on the web (for example, YouTube). 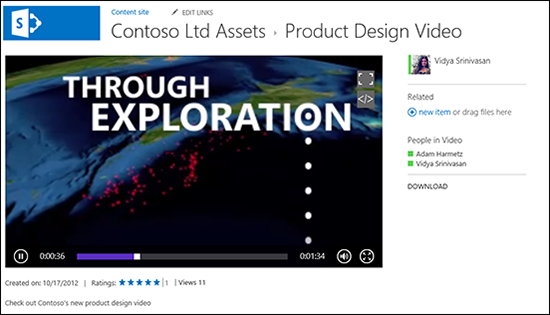 So, if your organization has a channel on YouTube with a collection of videos, you can now keep track and view those videos on your internal SharePoint site. 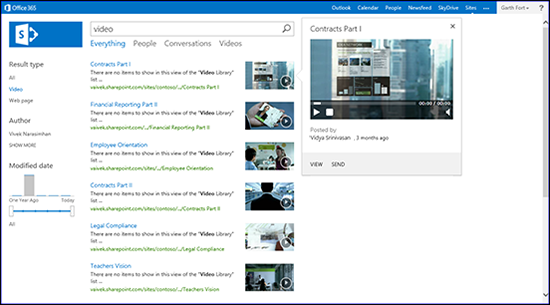 Options two and three enable users to create SharePoint videos from a variety of sources, even though the video file is not physically stored in SharePoint. SharePoint knows how to treat each of these files and ensures you get the relevant features regardless of the way you create them. We provide two types of thumbnailing: server-generated and user-selected. In server-generated thumbnailing, all that you have to do is upload your videos to a library with the video content type enabled, and SharePoint automatically generates thumbnails for your videos without you having to do anything else. Note that thumbnails are available only for formats for which the Windows Media Foundation on the server can generate thumbnails, meaning additional formats can be supported by additional codecs. The second option is user-selected thumbnailing. You can use our client-side thumbnail generator to set those perfect moments as thumbnails for your videos, in case the server-generated thumbnail is not the one you want to use. The thumbnail generator can be accessed from the video edit form. When you choose the change thumbnail link, you get an option to capture thumbnail from video, use a picture from my computer, or use a picture from a web address. Take a look at the screenshot below, where I captured a different thumbnail for my video using the camera icon, and the thumbnail is immediately reflected in the thumbnail previewer. Other cool features in the video space include video tagging, rating, and view counts. All these features take you a step closer in personalizing your video experience. You can now tag people in videos to help viewers know the people in that video. Enabling ratings from the library settings lets viewers rate your videos. This is especially useful when you want to have a way for your users to view the most rated or most popular videos in your portal. SharePoint also has a powerful analytics database that provides view counts on the video player page after search finishes crawling your video. All of the enhancements we’ve discussed wouldn’t be complete without giving your users a better way to find the videos they care about the most. 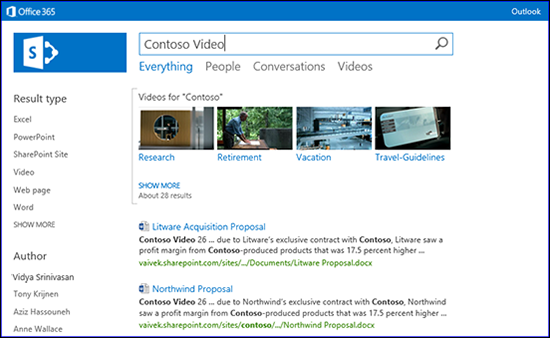 Search in SharePoint 2013 is full of enhancements and video is no exception. To start, let us introduce you to how we in the engineering team think of videos and search. At the top of the search results page, you’ll notice category headings underneath the search bar. We call these verticals. The one you’ll experience most often is the Everything vertical, where we display search results from all kinds of content types. Documents, pages, images, videos, and so on., all displayed on the same page. In the result list, on the Everything search result page (see Figure 5), you’ll see that videos stand out from pages and other content (kind of like documents do) with a thumbnail of the video on the right side of the result list. If you know it’s a video you’re searching for, the thumbnail in the search result gives you an easy visual cue that can help you identify what is and isn’t a video. Finding videos can be a daunting task when you have hundreds of thousands, if not millions, of pieces to sort through. Not only did we ensure that your search results are relevant to your search query, but we went a step further. We actually analyze your search terms and determine whether we think you were searching for video content. When this happens, you’ll see a grouping of the most-relevant videos matching your search query appear at the top of your search result page, allowing you to zero in on the video you wanted to find faster than ever. Hover over any search result in the organic result list and you’ll see what we named a hover card. This card is a peek into the item you’re hovering over, and its content is dependent on the type of result you’re looking at. For videos in particular, the hover card shows you the video’s name, length, the people present in the video, who uploaded it, and so on. Most importantly though, it features an actual video player so you can watch or preview the video right then and there. Remember the verticals I mentioned a few paragraphs up? The places where search results are grouped by their type? Video is no exception, and this is where you can go if you want to filter your results immediately to just videos. But, that’s just the beginning. We know that video search is an area that’s incredibly important, and we’re really proud of the experience we’ve built. Think of the Videos vertical as your video search command center. We designed this experience with the intent of enabling you to do as much on this specific page as possible. Here you can see many video search results and their thumbnails. Watching a video is a time-intensive task, and your time is valuable, so we didn’t want to make figuring out what video to watch a time-intensive task as well. With that in mind, we also added information below each result-view counts and duration-to help you decide which video is the one you want. Remember the hover card from the Everything results vertical? We wanted to give you all the great information and inline playing experience from that card here as well, but in a way that worked well with the video-specific thumbnail layout. Now, when you choose a thumbnail in the Videos vertical, we pull up the callout (that is, the on-click version of the hover card) with all of the great video information you expect. At the top of the callout, as with the hover card, is a built-in video player. All of these great features put together create a one-stop shop for finding your videos and watching them, without having to navigate between multiple pages. 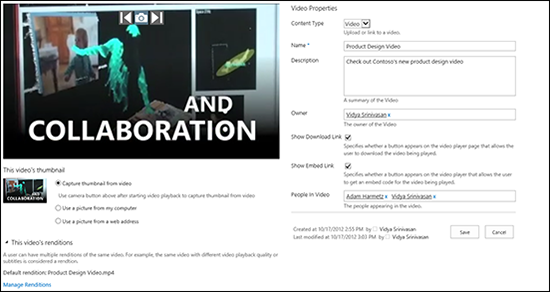 In SharePoint 2013, videos are treated as a content type as opposed to just a file, which provides a more complete experience for creating, uploading, finding, sharing, and viewing videos. Let us know in the comments about your favorite features in SharePoint 2013. Thanks for reading! Vidya Srinivasan and David Cohen are Program Managers on the SharePoint Enterprise Content Management team, and are responsible for the video experience in SharePoint 2013.